This is for the students who wish to get their paper published as soon as possible. Publishing before dead-line can be provided. There is no extra fee for Fast Track Publication. Submit your paper through the paper submission form. A Unique Paper ID will be provided within one hour via e-mail. Once the ID is received, you need to call us to opt for "Fast Track Publication". Provide co-author details (if any) and upload ID proof of atleast one author. Wait for an acceptance e-mail (Usually provided with 24 hours of submission). Pay your registration fee online using (Debit/Credit Card, Wallets or UPI). Get your paper published and receive certificates in your email. Note: This process will only work with your coordination as you need to complete the publicaton process on your behalf. You will need to add the co-author details, submit a vaild ID Proof and pay the registration fee. See Call for Papers for Volume 5, Issue 2 for the month of March-April, 2019. There are no submission charges for submitting your paper for review and publication. Registration fee is only to be paid after the paper is accepted. (Please do not pay unless it passes our quick review process and you receive a link to pay online). 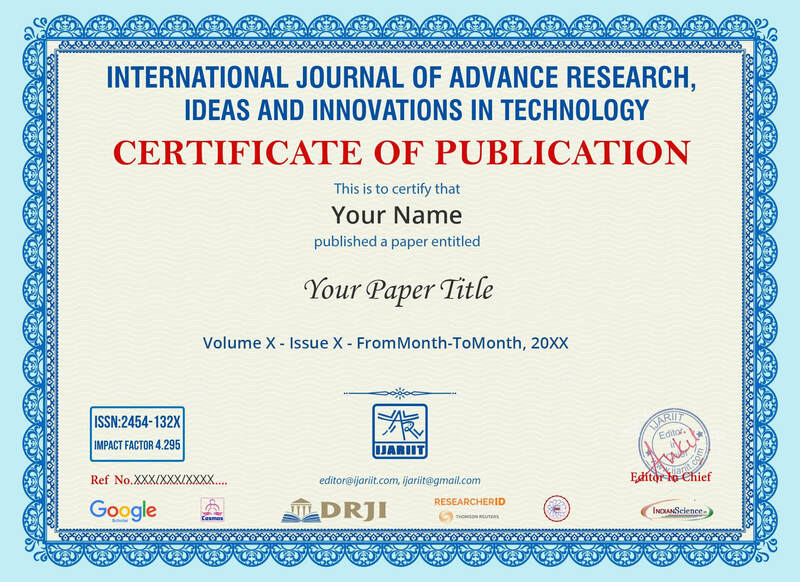 Author notification will be sent within few minutes, mentioning the Paper ID allotted to your paper. This will help you track your paper. Please make sure you update the expected date of publication, co-authors details and other information which will be asked on tracking page. This will help us provide you a smooth publishing experience. After you submit your paper, save the contact number: +91-8195072273 and keep an eye on your e-mail. Our system operates on Artificial Intelligence built by our technical team. This helps us speed up our process and provide a rich user experience to the authors. Manuscripts with number of pages greater than 10 will be charged Rs. 100 / USD 2 per page.